Recent satellite imagery shows Iran continues to clean up areas of a controversial military site believed to be involved in its nuclear program, according to analysis of the images by a Washington-based think tank. The Institute for Science and International Study obtained imagery from GeoEye taken on June 7 that shows heavy machinery tracks and earth displacement consistent with a cleanup effort at the Parchin Military Complex, according to the institute's analysis. GeoEye is a commercial satellite imaging company. The International Atomic Energy Agency has been seeking access to the site, where it suspects Iran may have conducted high-explosives tests related to the development of nuclear weapons. Two days of talks in Moscow this week between Iran and international powers ended with no agreement on stemming Iran's nuclear program. 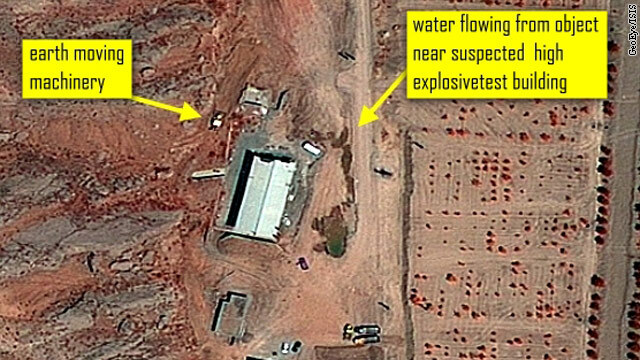 In its latest report, Institute for Science and International Study also said the new imagery shows "a notable flow of water" near an unidentified object next to the suspected explosive test building. "The water flows into areas that have considerable activity due to heavy machinery traffic or earth removal, activities which appear likely to persist," stated the report, written by David Albright and Robert Avagyan. The institute has been keeping tabs on activity at the site for some time and has periodically released reports analyzing the most recent satellite photos. Previous imagery showed buildings that have since been destroyed, roads that have now disappeared and other activity that the institute says indicates a cleanup effort by the Iranians. The institute pointed out that IAEA Director General Yukiya Amano, during a June 4 news conference, made reference to the various suspect activities at Parchin captured in satellite photos. "This recent imagery taken a few days after the statements shows the activities mentioned by the director general and confirms that the IAEA should be concerned that Iran is attempting to cleanse the site prior to allowing an IAEA visit," the report stated. The IAEA has continued to press Iran for immediate access to the Parchin site, but Iran has refused. Superb post however , I was wanting to know if you could write a litte more on this topic? I'd be very thankful if you could elaborate a little bit more. Appreciate it! I do agree with some of the statements about Israel, but that does not justiy the Iranian lies about their nuclear site. There are a lot better images of the clean up to prove this is in fact happening. Why lie when all it does is make you look guilty and up to no good. Iran has the same right as other countries, but this make's them look very shady. That's the resaon they are in this mess to begin with. told you iranians jump in and scrub your bodies, by the way I liked the message you sent in stone way to let us know what's here, we are ready are you. I do believe russia wants to put yall to the test first in syria, I bet 1 penny you can't beat russia. is that the inside of the body or the outside of the body, we would like to know. Ignore the anti semitic trolls. Evidence is again showing the Islamic regime is developing nuclear weapons and then trying to cover it up. More bs alleged by CNN. So, Israel, the country who developed illegal nukes from stolen plans..
THEN it complains about a country, who has never invaded anybody, having only the primordial ingredients for a fission reaction? Israel, the country in violation of more UN mandates and resolutions, than any other country...we hate you..
Israel paying CNN to re run this blatant propaganda piece?? We won't bleed for Israel. So stop. I agree, this is exactly what is taking place. Unacceptable. CNN needs to be charged with crimes against humanity, for the enormous charade they prop up. The time is ripe for an American rejection of the social, financial, and political corruption pushed on us by AIPAC and other Israeli assets. I don't know, any given president is also a damn good Israeli mouthpiece.. It's been reported on an every major news source and has nothing to do with CNN. Exclusive. Read the top dumb dumb..